This is part one of a three part series. By dividing it up, I’m hoping that you will take the time to read each section to the end as the plight of the amazing Orang-Utan depends on us. If we all help, they can be saved from Extinction! The following is an excerpt from the WWF website stating the plight of the amazing Orang-Utan. Orang-utans are being pushed to the brink of extinction! Orang-utan numbers have fallen to less than 14% of what they were in the 1950s. The biggest threat is the loss of their natural habitat, due to industrial scale deforestation, forest fires, mining interests and conversion to palm oil plantations. 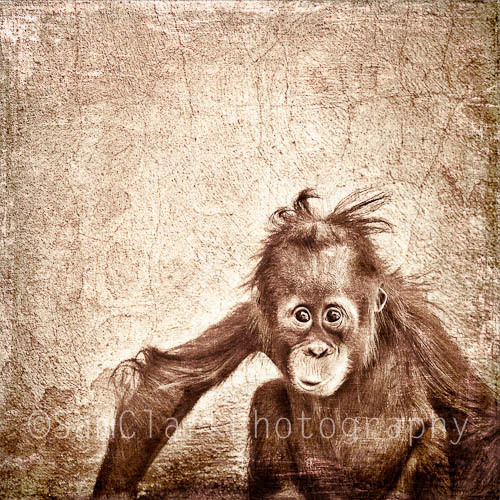 In the last century, around 80% of suitable Orang-utan habitat has disappeared. That is a CATASTROPHE!! The worlds insatiable demand for palm oil is one major factor in the Orang-utans decline. It is estimated that palm oil is present in more than 40% of packaged products on our supermarket shelves today. Grown sustainably, palm oil can be produced in an environmentally friendly way. WWF is working with Australian Businesses with palm oil in their products, to move to using certified sustainable palm oil. The huge demand for unstainable palm oil is placing an unbearable strain on the remaining rainforests- not least in Borneo. And as the forests disappear, the Orang-utan inches closer and closer to EXTINCTION! Please help us act now to avoid disaster. The Orang-utan needs our help, they can be saved! !